Beautiful clear blue waters, white pristine sandy beaches, luxury hotel accommodations, coral reefs for scuba diving... and the fantastic Carnival of Batabano celebrating life. You have arrived in the Cayman Islands. Night life in the Cayman Islands is filled with fine restaurants, entertainment, casinos and moon-lit romance celebrations. No to even mention the Cayman Islands being world known as the mecca of the diving community. 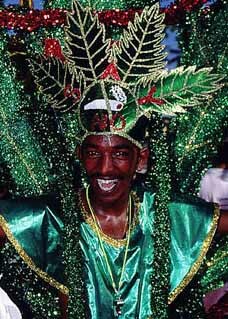 The celebration of the Batabano Carnival is an annual event usually held after Ash Wednesday. This is a communal celebration of life. It is rooted in the Caymanian diverse history, its colors reflect the landscape and the music is the very rhythm of life of the islands. Carnival is a cultural kaleidoscope of music, dance and pageantry from Brazil to Trinidad to St. Lucia. In 1984 the Rotary Club launched the annual affair of the Batabano Carnival, promoting street parades, floats and the awarding of prizes. The whole community grabbed hold of the celebration and has become the social event of the year! 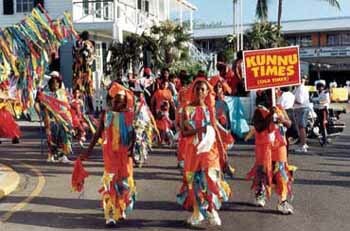 New Orleans has nothing on the Mardi Gras of the Cayman Islands. "Batabano" means turtle tracks. Christopher Columbus named the islands "Las Tortugas" because of the profuse number of giant sea turtles inhabiting the Cayman Islands... the Cayman Islanders became known as the best turtle fishermen in the region. Hence - the Batabano Carnival! The turtle has proven to bring much success to the Cayman Islands. The Turtle Farm is one of the major tourist attractions on the Grand Cayman Island. Not to mention their source of food and great success as an export. Yes, celebrate the deserving turtle! The wild colorful dress and costume of the Batabano Carnival celebration represents the opportunity to express creativity, imagination and talent through the interpretation of social issues, feelings of joy and fulfillment and the hopes and wishes and prayers for a prosperous year to follow. Thousands of locals and visitors flock into the streets every year to celebrate Batabano. The energy is electrifying. Communities and districts come together to create the floats and Mas' bands to compete for prizes. The glitter and music fill the streets and night spots. While many of the costumes have been traditionally inspired by Cayman's magnificent marine environment - the now awareness of today's social issues is showing through in depiction of issues local and worldwide such as the world's refugee crisis and drug abuse. 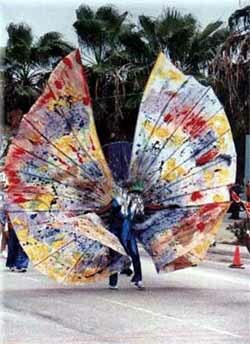 The Batabano Carnival is a time to display creativity, to voice social issues and of course... a time to party.